Crescat’s hedge funds ended 2016 on a positive note after the Trump presidential victory shocked global financial markets. Our flagship Crescat Global Macro Fund was up 8.9% in November and 12.5% net from November 9th through year end. BarclayHedge named it the #4 performing macro fund for the month of November after awarding it as a top-ten performer for the three years ended September. Crescat’s large cap separately managed account product also earned accolades last quarter. Morningstar awarded it a 5-star rating for both 3-year and 10-year risk-adjusted performance through September 2016. That means we are in the top 10% of 514 and 398 large-cap equity managers respectively over those time frames. Below, we show the net results for each of our products. Below, we provide a profit attribution for last quarter and investment outlook based on our macro themes, sorted from best to worst performing theme last quarter in our global macro fund. Our global macro fund was up an estimated 7.4% net overall in the fourth quarter. In our discussion below, we also talk about how the themes apply to our long/short and large cap products. In our Global Macro Fund, we reduced our China FX exposure by exercising two profitable yuan put options into USD cash without adding new exposure. We exercised these options at expirations on December 30th and January 3. In our Global Macro Fund, we still have short exposure to the currency through another yuan put option that expires in February and has an unrealized gain today. We also remain short offshore yuan futures. Ultimately, we believe it is still a twin currency and banking crisis that will unfold in China. We increased our equity ETF short exposure to China because equities in China should suffer most in the short run under a credit-crisis-first scenario. These ETF shorts get us short exposure to Chinese banks and other debt-burdened Chinese zombie companies. We also get indirect short exposure to the currency through these equity ETFs. We are currently short iShares MSCI China (MCHI), iShares China Large Cap (FXI), Deutsche X-Trackers Harvest CSI 300 China (ASHR) in our hedge funds. In this new theme, we have been short long-duration, ultra-low yielding fixed income assets, predominantly developed-market sovereign bonds in our global macro fund. In our view, sovereign bonds from several developed economies have reached secular-peak valuation levels corresponding to record low interest rates and inflation expectations. With rising wage and price expectations creeping into developed markets, we believe we have seen the long-term lows in long-term interest rates. This should be a new secular rising interest rate theme for us with lots of trading opportunity. With unsustainably high debt-to-GDP levels in developed economies, rising inflation is a powerful reconciling force for deleveraging debt-to-GDP. Yet the global developed bond markets today are still priced for the deflation-minded investor set. Inflation is ultimately what the central bank quantitative easing experiments of the last eight years will create. As investors move from a deflationary mindset, we believe we will see rising interest rates on the long-end of the yield curve. As a further catalyst, for many years, G20 central banks were net buyers of foreign sovereign debt. That trend peaked in 2014 at a record 7.9 trillion USD in worldwide foreign reserves. In the last two years, net global foreign reserve holdings among the G20 declined by more than $1 trillion, predominantly due to Chinese selling. The last time net G-20 central banks sold foreign reserves was during the Asian Financial Crisis in 1997. China is at the helm of another Asian crisis unfolding today. Continued net selling of global foreign reserves held by China will exert upward pressure on sovereign bond yields in the US, UK, Japan, and Germany. In our Global Macro Fund, we have been short long-duration US Treasuries, UK Gilts, German Bunds, Italian Government bonds, Japanese Government bonds through the futures markets. We believe such shorts are a contrarian, low cost of carry, high reward-to-risk way to get exposure to currently rising global inflation. What could possibly go wrong in the wake of the record eight-year global central bank quantitative easing experiment? In the US, monetary policy has been ultra-accommodative to boost economic growth since 2009. The Federal Reserve has kept real interest rates well below their theoretical natural rate for eight years, giving us confidence to believe in a rising inflationary environment going forward. Also, lower taxes under Trump are likely to worsen the government deficit which will put upward pressure on Treasury yields. With the realities of Brexit sinking in, we believe the weakness in UK government bonds will continue. The UK has a large current account deficit and a weakening currency, which is contributing to rising consumer prices even while it is still part of the EU. Possible import tariffs imposed by the EU under a “hard Brexit” could make inflation even worse. From February of 2016 to now, UK 5-year breakeven inflation rate has almost doubled — increasing over 130 basis points. 10-year Gilt yields are still only 1.3%. We expect UK government bond yields to go up much further. Eurozone issues are complex. We question the effectiveness of a single central bank monetary policy being applied to member countries operating under vastly different economic fundamentals. For example, Germany, a country with near full-employment and pressured by increasing inflationary rates, is operating under extreme accommodative monetary policy. The 10-year bund yield of only 0.3%! Italy, with a long-standing debt problem and unemployment rate at 11.5%, has a 10-year yield that has recently bounced off historic lows but is still only 1.9%, lower than USTs. In our view, neither of these yields are worth the risks of being long these bonds. At a 0.1% yield on the 10-year, we see an asymmetric risk/reward ratio in being short long-term Japanese government bonds (JGB’s). The Bank of Japan has monetized over $4.3 trillion in assets, 82% the size of its economy. With government debt at 240% of GDP, we expect inflation rates in Japan to rise faster than investors today think. Our research shows that the financial sector does best in a rising interest rate environment alongside a healthy economy. This theme is positioned for a Fed interest rate raising cycle and a continuing strong US economy. This theme should continue to do well under a honeymoon with Trump and the Republican sweep. The honeymoon could last at least two years until the next Congressional elections. It has become a long-equity theme across all three products for us in the US financial sector. Financials are the top scoring sector in Crescat’s fundamental equity model! Our bond shorts that used to also reside in this theme have been moved to Peak Deflation. We increased our long exposure to financials the day after the election with the Republican sweep pointing to more likely fiscal stimulus measures in 2017, including tax cuts, that would be likely to keep the economy growing and the Fed in an interest rate rising cycle, a gradual but still accommodative one. Banks’ net interest margins (NIMs) have been compressed over the past years because of the ultra-low interest rate environment. Among all US banks, average NIMs remain at their 7th percentile for the last 17 years. Net interest margins are poised to improve under rising interest rates and an improving US economy. In addition to the negative impact on profitability of low interest rates, this industry has also been holding back on creating loan growth since the Global Financial Crisis due to weak loan demand and restrictive Dodd-Frank regulations. The average loan-to-deposit ratio for US banks is only 80%. This is not only historically low but also among the lowest levels worldwide. The overall US banking industry has $1.9 trillion in excess reserves which further illustrates pent-up lending capacity. In our hedge funds, we currently own Bank of America (BAC), BOFI Holding (BOFI), Capital One (COF), Discover Financial (DFS), Evercore Partners (EVR), Everest Re (RE), Lincoln National (LNC), Freddie Mac (FMCC), Fannie Mae (FNMA), JP Morgan (JPM), PNC Financial (PNC), Primerica (PRI), Synchrony Financial (SYF), and Travelers (TRV) all of which are supported by our model. In Large Cap, we hold BAC, COF, DFS, GS, and JPM. This theme focuses on the ripple effects of a slowing China and a strong US dollar. In our hedge fund strategies, we have short positions in iShares Emerging Markets (EEM), iShares South Korea (EWY), and Vanguard Emerging Markets (VWO), ETFs that include China’s largest regional trade partners. We obviously continue to be concerned about the risks of a twin banking and currency crisis unfolding in China. Either or both outcomes would be detrimental to trade partners who rely on a growing China. Additionally, many countries and companies in these three ETFs could be adversely impacted by trade re-negotiations under the Trump administration. In this theme, we have exposure to British pound sterling and euro shorts in our Global Macro Fund. Europe and the UK constitute high total debt-to-GDP countries, whose currencies we believe will be subjected to further devaluation through local inflation in order to resolve the debt problem. Europe has an ongoing quantitative easing program that we believe will further devalue the currency and create inflation. Great Britain was never a part of the Eurozone currency regime. But, it is a part of the European Union. Its citizens voted to exit the EU. Already rising inflation in the UK plus risks of increased tariffs and trade restrictions in a “hard Brexit” scenario are additional reasons to be short pound sterling. We are also short UK equities in both hedge funds through the iShares MSCI United Kingdom ETF (EWU) based on globally high valuations, rising inflation, and general Brexit risks. Rise of the Machines was Crescat’s best performing theme across all three strategies for the full year last year. No longer science fiction, the age of artificial intelligence (AI) has arrived. It’s still early days and machines are far from surpassing humans in key areas of intelligence. However, AI is making strides in areas such as self-driving cars where human error is prone. AI technologies are mostly used today to enhance human intelligence and decision making. Examples include, weather forecasts, email spam filtering, search predictions, targeted advertising, voice and facial recognition, fraud detection, and medical diagnosis. What these technologies have in common are machine-learning algorithms that enable computers to react and respond to data in real time. Crescat currently owns Alphabet (GOOG), Apple (AAPL), Applied Materials (AMAT), Integrated Device Technologies (IDTI), Microsoft (MSFT), Nvidia (NVDA), Twitter (TWTR), and Xilinx (XLNX) as part of our Rise of the Machines theme in our two hedge fund strategies and GOOG, AAPL, AMAT, NVDA, and TWTR in our large cap strategy. These stocks are highly ranked in our model. Crescat has owned NVDA since 2014 across all three of our strategies at an average initial cost basis of $18.30 per share. Brought to our attention by our model, the Crescat investment team did a deep dive on the company and presented it a value investing conference in June of that year. Last year, the stock went above $117 per share and was the best performing stock in the S&P 500! While we have taken partial profits along the way, we still own the stock in all three Crescat strategies and it still scores well in our model. Nvidia invented the graphics processing unit (GPU), a technology that has become the key technological horsepower behind deep learning algorithms and neural networks where AI is making its most tangible strides. Nvidia dominates visual processing technology with over 7,000 patents and sells its processors to essentially ever major technology company. NVDA is poised to become the leader in supercomputers that power self-driving cars. Elon Musk recently signed a deal to make Nvidia the exclusive onboard AI supercomputer for the self-driving features in all of Tesla’s vehicles. Many economists today long for a miracle productivity surge to combat the negative forces of aging demographics, high debt, and secular stagnation. AI could be such an innovation. Our New Oil and Gas Resources theme covers world energy markets working through the effects of oversupply from the US shale boom. World crude oil storage remains very full, but things have been looking up for the price of oil as production has been declining in many non-OPEC countries, and OPEC agreed on an adequately large production cut. Despite these bullish signs, US dollar strength combined with slowing growth at the least in China should prevent oil prices from getting too much stronger from here. We stepped out of our oil shorts last year after two successful years, but we are not comfortable getting long oil here. We have been more interested in long positions in natural gas. On the natural gas side, production in the US continues to roll over in key basins. Weather forecasts have outsized influence on prices, but even an average winter in the US will draw natural gas in storage below the five-year average as withdrawals outpace injections. In our global macro fund, we have long positions in natural gas futures spread out across the curve to reduce volatility. We are also long three natural gas exploration and production companies in both hedge funds which are supported by strong within-industry scores in our fundamental equity model: Cabot Oil and Gas (COG), Range Resources (RRC), and EQT Corp. (EQT). 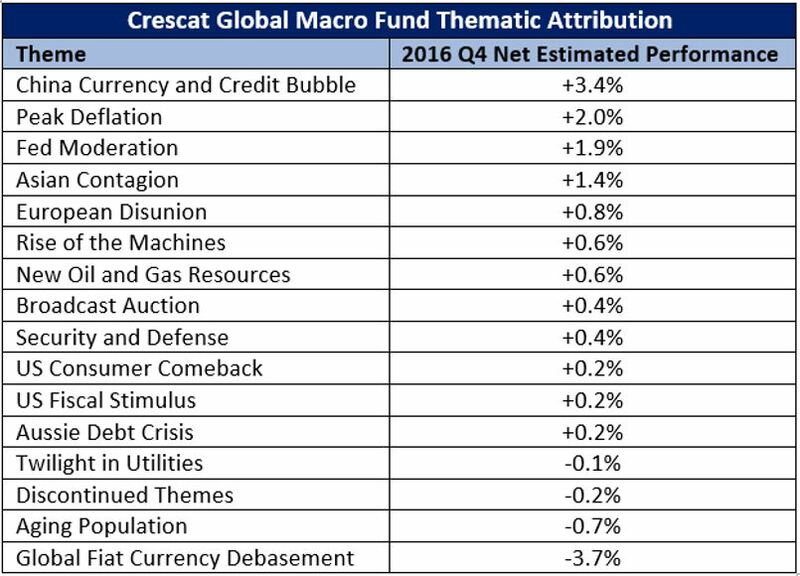 Our Broadcast Auction theme was profitable for Crescat’s hedge funds in 2016. Originally intended as a short-term opportunistic theme, the highly secretive FCC spectrum auction has been dragging out longer than we originally envisioned. Still, it holds promise for the nine stocks that we are long in our hedge funds: Entravision (EVC), EW Scripps (SSP), Graham Holdings (GHC), Meredith (MDP), Media General (MEG), Nexstar (NXST), Sinclair Broadcasting (SGBI), Tegna (TGNA), and Tribune Media (TRCO). In our view, these often-maligned, old-school media companies create valuable content and have positive free cash flow generating core businesses that are not as bad as they seem. They also own hidden spectrum assets of significant value relative to their market values that could be soon monetized. In our large cap product, we own the three of them: SBGI, TGNA, and TRCO. We live in a world with rising geopolitical tensions. China is expanding its military force and making territorial claims in the South China Sea. Trump and Putin could begin a new nuclear arms race. War and tensions in the Middle East continue and terrorism has been on the rise globally. US defense spending will likely increase under Trump and a Republican Congress. The hedge funds own Boeing (BA), Flir Systems (FLIR), Huntington-Ingalls (HII), Lockheed Martin (LMT), Northrop Grumman (NOC), and Raytheon (RTN) in the defense sector which are all supported by our model. In large cap, we own BA, HII, and RTN. Cyber security is becoming a larger part of the national security picture as well. Cyber security can be framed as an arms race between hackers and their targets. With many high-profile hacks over the past few years, including Russian espionage to influence US elections, increased investment in cyber security will only continue. This trend favors companies we own in our hedge funds, which provide a range of security products and services. These companies include Akamai Technologies (AKAM), Checkpoint Software (CHKP), Cisco (CSCO), F5 Networks (FFIV), Fortinet (FTNT), Juniper Networks (JNPR), Netapp (NTAP), Palo Alto Networks (PANW), and Qualcomm (QCOM), all supported by our model. Large cap holds CHKP, CSCO, FFIV, NTAP, and PANW. With strong employment and rising consumer confidence in the US, we have been cautiously dipping our toes into consumer discretionary stocks supported by our model in our hedge funds. These positions include Caleres (CAL), D.R. Horton (DHI), Electronic Arts (EA), and Lennar (LEN). The biggest fiscal stimulus boost under a Trump administration and a republican US Congress is likely to come from tax cuts that would both boost corporate bottom lines and put more money in the hands of consumers. Many companies that will be beneficiaries of tax cuts are already long positions in other themes including consumer, healthcare, technology, and financial stocks. This new theme is still under development. We hold infrastructure spending plays in it for now. In our hedge funds, we own United Rentals (URI), Emcor (EME), and Eagle Materials (EXP) which we added shortly after Election Day. The need for infrastructure spending appears to be a rare point of agreement among democrats and republicans in Washington. These companies supported by our model are poised to benefit from even a minor public-private partnership boost in infrastructure spending. One of the big factors driving the housing and mortgage bubble in Australia over the last decade has been capital outflows from China flowing into Australia’s housing market. With Chinese authorities now clamping down on capital outflows in earnest, it’s a clear headwind for Australian real estate. It’s the Australian banks that are holding the bag when it comes to Australia’s excessive mortgage debt. These banks have a high average loan-to-deposit ratio of 120%, higher than Asian banks prior to the 1997 Asian Financial Crisis and higher than US banks prior to the 2008 Global Financial Crisis. Australia has a historically high level of household debt to income, 186%. This ratio is even higher than in the US in 2007 after our housing bubble peaked where the ratio reached only 132%. At the peak of the US housing bubble, publicly traded US banks had close to $8.4 Trillion in total assets, or about 60% of nominal GDP at the time. Today, Australian banks own close to AUD3.6 trillion in assets, or about 225% the size of the Australian economy. The majority of these assets are domestic real estate loans. The number of permits that have been issued for new construction, including pre-existing structures or major renovations, in the private sector declined the most last quarter in 26 years. Australia monthly housing starts recently dropped by the most since 1990. Due to historically high valuations and our concerns about the bond market, we continue to expect further downside for US utility stocks. These stocks have recently declined because of a shift in investors’ mindset after elections. With increasing hopes for a stronger economy, we have seen a market rotation out of traditional safe-haven stocks like utilities. The problem is that utility stocks are not safe havens. These capital-intensive companies are terrible fundamental businesses. In aggregate, the overall sector has reported close to $1.1 trillion in capital spending for the last 16 years. These investments generated less than $340 billion dollar in earnings and a loss of $41 billion in free cash flow during the same time. These stocks also performed terribly in the last two recessions, not like safe havens. Utilities are likely to suffer in a rising interest rate environment because they tend to burn through capital and are frequently needing to add new debt and dilutive equity. As of their latest quarterly reports, utility companies are currently paying an average of 4% interest on their total debt. In a realistic scenario, if their borrowing costs go up by two percentage points, the aggregate earnings of these companies would decline by 42%. Our quant model has been warning us about the overvaluation of the utility sector for several months. Ranked as the second worst sector in our fundamental model, many utility stocks are still trading near their highest valuations in history. In the trailing four quarters, they reported their worst annual free cash flow since 2000 – negative $15 billion in aggregate. Desperate for yield, investors actually bid these companies up 16% in 2016. The S&P 500 utility sector plunged by more than 34%! From their peak level in July 2016 utility stocks are down less than 10%. Utilities trade at much higher multiples today than in 1993. The Trump administration is promising energy deregulation. While it is unclear yet exactly how Trump will impact utilities, deregulation historically has hurt the industry. The days of monopoly pricing power are gone. In our hedge funds, we are currently short Atmos Energy (ATO), Black Hills (BKH), CMS Energy (CMS), Calpine (CPN), Duke (D), Consolidated Edison (ED), Edison International (EIX), Nextera (NEE), Nisource (NI), PG&E (PCG), Sempra (SRE), and Utilities Select SPDR (XLU). Debt-to-GDP-Resolution. While we still believe that high levels of debt to GDP worldwide will be resolved by some combination of real growth and inflation, the positions in this theme began to fit more directly with newer themes, particularly with short positions in the euro and pound sterling falling into our new European Disunion theme. Our Japanese yen short position has moved to Asian contagion. Digital Evolution. We re-allocated most of our technology-related longs to two newer themes, Rise of the Machines and Security and Defense. Maturing Expansion was a short-lived and unsuccessful theme during the middle of 2016. Amidst both Republican and Democratic campaign rhetoric, health care stocks underperformed in 2016. We profited from our Biotech Bubble theme by being short frothy biotech stocks earlier in late 2015 and early 2016. The steep decline in the sector overall has left many larger biotech and pharmaceutical companies attractive to us on the long side. Many of these companies have high free cash flow yields and decent growth still ahead. In our hedge fund strategies, we are currently long Amerisource Bergen (ABC), Amgen (AMGN), Biogen (BIIB), Bruker (BRKR), Celgene (CELG), Johnson & Johnson (JNJ), and Natus Medical (BABY). In large cap, we own AMGN and JNJ. Global Fiat Debasement is Crescat’s long-running precious metals theme. How can we still be bullish on gold and silver if we are in now in a rising interest rate environment in the US? Conventional wisdom says that rising interest rates are bearish for precious metals. Such wisdom is not supported by market history. Gold and silver’s biggest run-up ever in the US came during the decade of the 1970s, a period also marked by record rising interest rates. Rising inflation expectations is what drove gold higher at that time. Rising interest rates did not matter. Higher rates did not quash gold until Fed Chair Volcker raised them substantially above the inflation rate in 1980. Since the Global Financial Crisis, the Fed and other global central banks have deliberately kept interest rates low relative to inflation to stimulate economic growth and devalue debt. Despite eight straight years of easy money, we remain only in the early innings of a rising inflation cycle. We believe there is much pent up inflation in the global economy and that precious metals are historically cheap relative to the global fiat monetary base. Gold is a central bank reserve currency asset. Inflation is necessary to resolve the historically high and unsustainable global debt-to-GDP imbalances in the world’s major economies including the US, China, Japan, Europe, and UK. In our Global Macro Fund, we have been short these foreign currencies. Thus, we have effectively been long precious metals not just in dollar terms but through a basket of high-debt-to-GDP global fiat currencies. Q4 was rough for this theme, but Global Fiat Debasement was still positive for us overall in 2016. It was our second best performing theme for the year across all three Crescat strategies. It is also one of our best performing themes to start 2017. In our global macro fund, we own gold and silver futures as well as options on gold futures. We also own twelve gold and silver mining companies in both hedge funds that are supported by our model: Agnico Eagle (AEM), Barrick Gold (ABX), Cia De Minas Buenaventura (BVN), Coeur Mining (CDE), Detour Gold Corp. (DGC CN), Franco Nevada (FNV), Kinross (KGC), Newmont Mining (NEM), Hecla Mining (HL), Pan American Silver (PAAS), Silver Standard (SSRI), and Tahoe Resources (TAHO). In large cap, we own AEM, ABX, FNV, NEM, as well as SPDR Gold Shares (GLD) and iShares Silver Trust (SLV) ETFs. In large cap, we consider GLD and SLV as a part of our cash position. Passive indices have outperformed most active managers for eight years now in what to us looks like a full economic cycle. Crescat has beaten the market and most other active managers substantially, net of fees, through a variety of market environments in all three of our products. We have also notably beaten the benchmarks and our peers on a risk-adjusted basis as measured by alpha, Sortino ratio, and omega ratio in each product as we show in our performance reports. 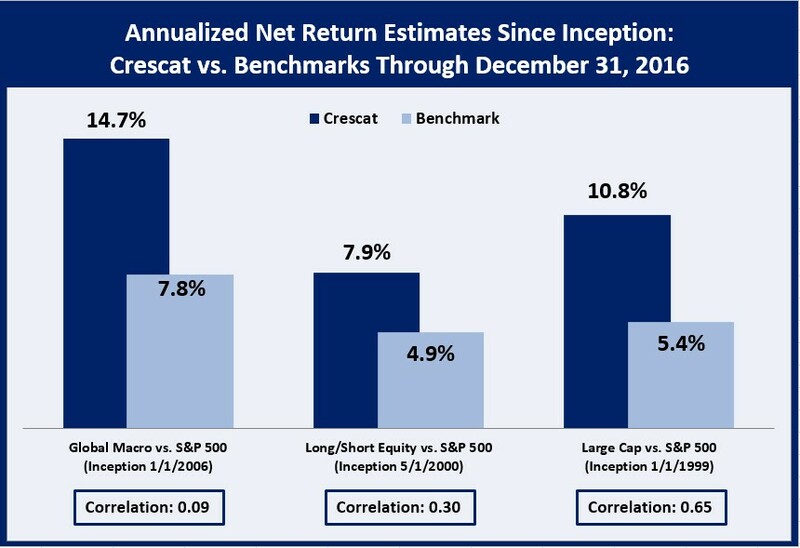 Investors should do very well by deploying proven active managers like Crescat over the long term. Over any reasonable timeframe, ideally five years or more, we believe we can significantly protect and grow our clients’ capital. Our motivation is to create happy, long-term clients! Crescat Global Macro: A diversified, multi-asset class long/short global hedge fund that trades and invests in highly liquid global assets including equities, commodities, currencies, and fixed income securities. Crescat Long/Short: A diversified global long/short equity hedge fund that trades and invests in highly liquid large- and mid-cap global equities. Crescat Large Cap: A diversified large-cap, long-only separately managed account (SMA) strategy that trades and invests in predominantly US-listed large cap global equities. Crescat has a firm-wide investment process of combining macroeconomic themes with a fundamental equity model and disciplined risk controls that it applies to all three products. It’s an investment process that has evolved with each successive strategy. Kevin Smith started the large-cap, long-only equity product at a prior firm in 1999 building off his fundamental equity model that he originally began developing back in 1994. He also launched the long/short equity hedge fund strategy in 2000. He founded Crescat, where he launched the global macro product in 2006. Crescat acquired his other strategies and clients in 2007. Today he leads a team of seven investment professionals. He has been the continuous portfolio manager of all three products since their respective inception dates.